We’d love your help. 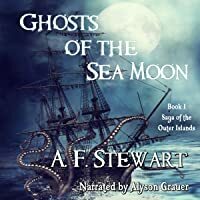 Let us know what’s wrong with this preview of Ghosts of the Sea Moon by A.F. Stewart. His sister, the Goddess of the Moon, is on a rampage and her creatures are terror In the Outer Islands, gods and magic rule the ocean. 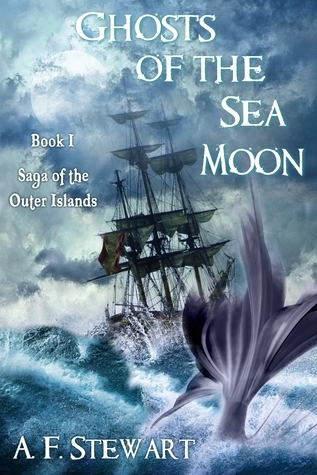 To ask other readers questions about Ghosts of the Sea Moon, please sign up. Recap: Captain Rafe Morrow, of the Celestial Jewel ferries souls to the afterlife but his sister, the Goddess of the Moon, is being on his destruction. Review: Some great world building here and I loved all the nautical references. Rafe is a complex and likeable character and there are some unique extras in his crew. Then madness of the Moon Goddess was well written and Hugh's role in the god's argument was amusing. Occasionally the dialogue became stilted and wooden which jerked me out of my rea Recap: Captain Rafe Morrow, of the Celestial Jewel ferries souls to the afterlife but his sister, the Goddess of the Moon, is being on his destruction. A god and goddess. A brother and sister. Locked in an eternal battle of hatred. The sea churns. Monsters scream. The living and the dead fear for their existence. Such is to be expected in A. F. Stewart’s, Ghosts of the Seamoon, book one of the Saga of the outer Islands. Nothing short of high sea adventure, intense battles and burning magic. The back of the book sums it up nicely. What you fill find in this read of nautical fantasy is a heart felt story about a seafaring captain who happens to be A god and goddess. A brother and sister. Locked in an eternal battle of hatred. The sea churns. Monsters scream. The living and the dead fear for their existence. What you fill find in this read of nautical fantasy is a heart felt story about a seafaring captain who happens to be a god. He is humble to those he cares about yet terrifying to those who would double cross him. Strong elements of light vs. dark permeates the pages throughout the story while good and evil pivot against one another in vivid description and forlorn. Stewart has learned the terminology of the genre and understands what it means to be a sailor at sea. She captures the true essence of what it’s like to be a sailor in dangerous waters. The continuous struggle of pushing and pulling between his sister and himself lingers throughout the duration of the story. With some twists and turns, the main plot serves as the driving force of Captain Rafe Morrorw’s decisions the entire time. At one point an ominous power is introduced as the root of evil, but the interjection is seldom visited and left vague in it description. This will leave the reader guessing but it is a good guess and mystery left to be discovered at some other point in time. This book is definitely for readers interested in the genres of fantasy, adventure, and magic. I look forward to the next installment for this is slated as a series. 4 out of 5 stars. In the meantime, if your looking for more of the saga of the outer islands story, check out A. F. Stewart’s short story Seabound. It takes place in the early days at the start of Captain Rafe Morrows career as a sea captain. Short and to the point, it is very well written and compelling to no end. It possess all of the right elements of curiosity and mystery, a fool at heart, and the ever-persistent iron bound will of Rafe. This fantasy is laid in a world of islands and sea voyages, imbued with and ruled by magic. However, it’s not a fairy tale world – it’s rather a world of mythology, where gods and men interact. I was reminded of the Greek pantheon, gods and goddesses that are all too human, with the human flaws and virtues that help us relate to them. Rafe Morrow is Captain of a magical ship called the Celestial Jewel, but he is also the powerful God of Souls; his ship protects and rescues departed souls, helpin This fantasy is laid in a world of islands and sea voyages, imbued with and ruled by magic. However, it’s not a fairy tale world – it’s rather a world of mythology, where gods and men interact. I was reminded of the Greek pantheon, gods and goddesses that are all too human, with the human flaws and virtues that help us relate to them. Rafe Morrow is Captain of a magical ship called the Celestial Jewel, but he is also the powerful God of Souls; his ship protects and rescues departed souls, helping them pass to the Afterlife. Unfortunately, he has garnered the vengeful ill-will of Manume, his sister and Goddess of the Moon, because he wouldn’t or couldn’t prevent the human man she loved from dying. She has empowered her “children” – mighty sea monsters – to eat the souls of drowned sailors, and Capt. Morrow can’t allow her to continue in that course. The tale concludes with a monumentally epic battle between the God of Souls and the Goddess of the Moon. It’s easy to get hooked on this world – it’s strangely believable, for all its magic and monsters. I’ll definitely be reading the sequel. Although this is a genre I don’t usually read, some ‘tidbit’ ads caught my attention and I picked up a copy on pre-order. I’m glad I did, as the author’s descriptive writing brought the turbulent seas vividly to life. Anyone who likes Marvel fantasy epics, mixed with a hint of ‘Pirates of the Caribbean’ and the broad brush strokes of a traditional ghost story, is sure to enjoy this tale. Well worth a look. Brilliant piece of brand new mythology. Gods and monsters are exquisitely created for this magnificent world that she’s created. Thrilling and captivating, this is a book that’s easy to get lost in and hard to put down. I'm from Nova Scotia, Canada, and I write speculative fiction (fantasy, sci-fi, horror), as well as poetry. I have been plying the trade for several years, periodically interrupted by those pesky events from life. I have published independently and authored such books as the Saga of the Outer Islands series, the Killers and Demons series, Fairy Tale Fusion, and Ruined City. I've also had stories pu I'm from Nova Scotia, Canada, and I write speculative fiction (fantasy, sci-fi, horror), as well as poetry. I have been plying the trade for several years, periodically interrupted by those pesky events from life.